So much for out and about early. A variety of reasons kept the Dawn Jogger inside this morning. Others also did not venture into Central Park. The rapidly melting snow and increasing brown spots meant Cedar Hill – a sledding paradise since her arrival – once again belonged solely to the dogs. Once she did get on her way, she decided that another Broadway (well in this case Off Broadway) matinee followed by an early dinner made sense. Her choice was a “chick show” (first cousin to “chick flick”), the frothy and entertaining Love, Loss and What I Wore. The current cast includes Broadway stalwart Didi Conn and Loretta Swit of Mash fame. A fun 90 minutes. It was then off to a good dinner at Bar Americaine, which despite its celebrity chef (Bobby Flay) and commercialism, served good food. On her way to the theater, she decided it would be fun to photograph the photographers. 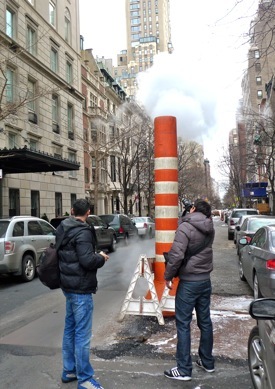 First, she spotted two men looking at different angles at the steam vent on 74th St. (both were European, just for the record). 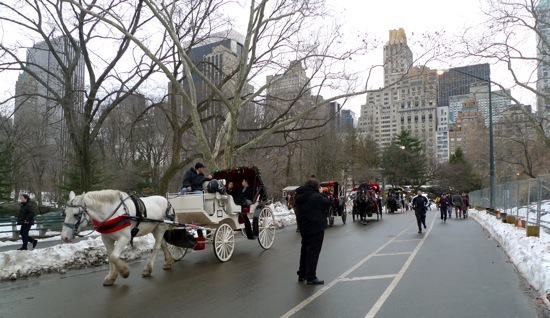 Then she watched as another European man stood in the middle of the roadway to chronicle the onslaught of horse driven carriages that make their way into Central Park. This entry was posted in On the road and tagged Central Park, holiday in New York City. Bookmark the permalink.